Bringing together a pageant of characters including Custer, Sherman, Grant, and a host of other military and political figures, as well as great native leaders such as Crazy Horse, Sitting Bull, Geronimo, and Red Cloud, The Earth is Weeping is an account of how the West was won…and lost. Balance is what Cozzens is seeking in this detailed recounting of random carnage, bodies burned, treaties broken and treachery let loose across the land. 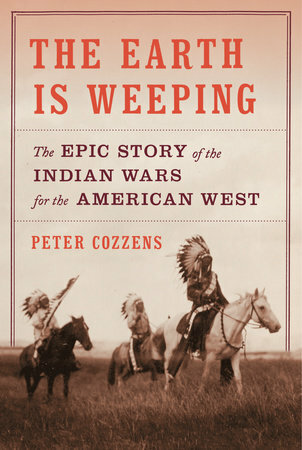 Although the book is not a seamless narrative, and its writing is sometimes stodgy, Cozzens admirably succeeds in framing the Indian Wars with acute historical accuracy ... Cozzens excels at showcasing how rogue officers often disregarded orders from Washington in pursuit of glory. At the same time, he is very clear that many Army officers behaved honorably. A sweeping work of narrative history that synthesizes the work of countless historians, the book is intended as an evenhanded account that recognizes fragments of nobility and humanity amid epic tragedy ... Without implying any false equivalence, Cozzens emphasizes history’s tangled complexity. Outbreaks of violence were sometimes provoked by Indians, sometimes by whites. Neither side had a monopoly on cruelty ... Cozzens excels at crisp, muscular prose that offers clear pictures of men at war ... If individual battles are described with clarity and brio, the reader’s overall sense of things can nonetheless be blurred. The book, set squarely in the past, is all narrative and short on analysis. The battle scenes, however, are painted with expert brushstrokes on a wide canvas, from the 1860s to 1891. While the book offers a valuable panoramic view and shows us the Army through fresh eyes, its depiction of native peoples is at a certain remove, and we feel their otherness more keenly than we do the injustices perpetrated against them ... A stronger framing of the native past, including spiritual traditions and linguistic diversity, would have helped readers appreciate what was lost when native ways of life were all but obliterated by the end of the 19th century ... Treachery on such an epic scale can bear many retellings, and this account stands out for its impressive detail and scope. What did you think of The Earth Is Weeping: The Epic Story of the Indian Wars for the American West?